It’s the year 1829, and a woman named Agnes Magnúsdóttir has just been convicted for her part in the murders of two men- Pétur Jónsson and Natan Ketilsson. Sentenced to death, Agnes is sent to the farmhouse of District Officer Jón Jónsson to live out her final months as a prisoner, labouring for Jónsson and his family- which consists of his sickly yet strong wife Margrét, their two young daughters Steina and Lauga, and their various household and farmyard staff. Uncomfortable with the situation, yet unable to do anything about it due to politics and duty, the family tolerates Agnes’ presence, and try to avoid speaking to her unless absolutely necessary. One of the few who does try to communicate with the convicted murderess is young Assistant Reverend Thorvardur ‘Tóti’ Jónsson, who has been appointed as Agnes’spiritual guardian, and whose mission it is to bring her towards God in her final moments. He travels regularly from his family home in Breidabólstadur to visit with Agnes and eventually starts to learn her story, which had previously been obscured beneath rumours and ‘official’ accounts. As Tóti learns more about his charge, the family, too, learn Agnes’ story, and the role that she played in the murders. All is not as it seems and it appears that prejudice has played a strong part in Agnes’ conviction. As the summer months pass into a harsh winter, the family are forced to work side by side with Agnes, and as her unfortunate tale emerges, the family’s compassion for her grows. But at the same time, Agnes’ execution date draws ever nearer. Will they be able to right wrongs and get Agnes a reprieve? Or will politics, perceived guilt and unjust obligation win out? This is a stunning debut from Hannah Kent, which deals with personal freedom, love, and battles for survival. The narrative shifts between Agnes’ first person accounts, and the second-person perceptions of the people that she has been forced upon. Through these varying views, the reader is able to learn Agnes’ story about what really happened on the night of the murders, and get a sense of who she is as a person versus what other people believe her to be like. Kent’s explanations at the start of the novel regarding pronunciations of Icelandic words, and the system by which names are given also help readers to understand specific nuances which may previously have caused confusion. 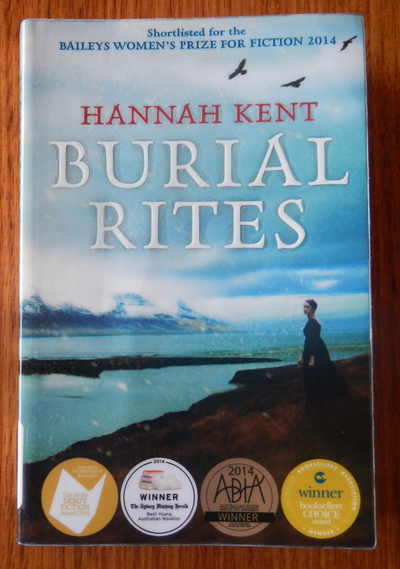 Set in the harsh landscape of rural Iceland, and based on a true story, this novel is brilliantly written, and very deserving of the many awards it has won. With all the moral issues it deals with, it is also no wonder that this book has been added to the VCE English curriculum in Australia. Fraught with the topics and themes that schools like their students to analyse, critique and discuss in their higher level exams, this book is not light reading. But the story is an engaging one and readers will no doubt be drawn into Agnes’ ill-fated tale.